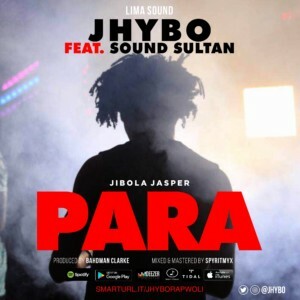 Jhybo delivers his first single of the year, a powerful track called Para. Para is a fusion of Afrobeat & Grime -Produced by Bahdman Clarke, mixed & mastered by Spyritmyx. Jhybo features the legendary Naija Ninja Sound Sultan & samples Fela Anikulapo-Kuti on backing vocals. Para will be the first track of Jhybo’s forth coming EP, titled Jibola Jasper.